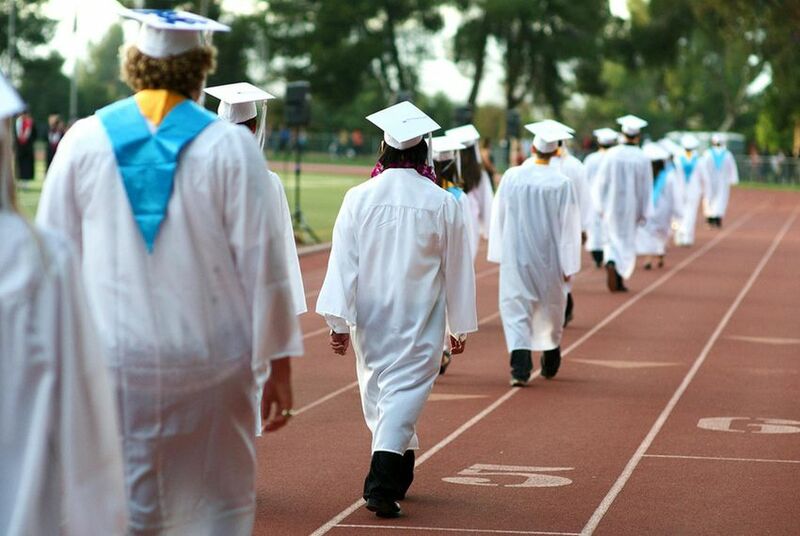 Texas High School Graduation Rates Among Top Nationally, But Why? While skeptics say reporting requirements for state graduation rates contain too many loopholes, other education policy experts say Texas deserves credit for implementing innovative programs to keep students in school. Preliminary data released by the U.S. Department of Education this week shows that Texas — along with five other states — ranks fourth in the nation for its four-year high school graduation rates. With an overall rate of 86 percent in the 2010-11 school year, the state follows Iowa, with 88 percent, and Wisconsin and Vermont, both at 87 percent. In 2006, research from Harvard University, the University of Texas at Austin and Rice University showed that the state was inflating its graduation numbers by allowing districts to avoid counting students who left school for a variety of reasons, including to take the GED. The state began using the federal definition from the National Center for Education Statistics to measure dropout rates that year, a formula that all states must use now. Michael Williams, the Texas education commissioner, attributed the achievement to the state’s strong accountability system. “This state-by-state comparison confirms what Texas educators have been saying for a long time," Williams said in a statement. "Our public schools are delivering a high quality education and our students are having great success." Despite the struggles in its past, the state’s recent success shouldn’t be greeted with disbelief, said Lili Allen, a policy director at Jobs for the Future, a Boston-based nonprofit that funds research on college and career readiness for low-income students. Allen pointed to a 2012 report released by a coalition of national education research organizations that showed Texas had made a dramatic reduction in the number of “dropout factory” schools — defined as graduating less than 60 percent of their students in four years between 2002 and 2010. The state eliminated the number of those schools by more than half, making a larger decrease than any other state. Allen also credited the state’s early college high school initiative, which allows students to take a higher number of dual-credit courses earlier than their peers at traditional high schools, as an example of innovation. But some critics say the federal definition, while an improvement, still allows states and districts to mask true graduation numbers. School officials report student withdrawals with more than a dozen different “leaver codes,” only some of which count toward graduation rates. If a school codes a student as returning to a home country, or entering home school, for instance, that student does not factor into the school's four-year graduation rate. The leaver code system can make gathering accurate numbers for graduation rates a challenge — especially because a low graduation rate holds ramifications for everyone involved in tracking student achievement, from principals and school leaders to state lawmakers. In the past, the TEA has audited districts for misuse of the codes, which have also drawn criticism from advocacy groups in the past. The codes provide too many opportunities for school districts to artificially boost graduation numbers, said Bill Hammond, the president of the Texas Association of Business, which advocates on education policy in the state. The rate reported by the state tends to show better performance than other national formulas used to track graduation. In 2009, the latest year graduation statistics are available in the federal data used by the Cumulative Promotion Index, a different method of calculating graduation rates, put the state at 72 percent, compared with the TEA’s 80 percent that year. But the state’s rate has improved over the years on that index as well — the percentage of students graduating on time has increased more rapidly than average, up by 11 percentage points since 1999 compared with 7 percentage points nationally — though it still lags behind the national average by about 2 percentage points. Texas’ improving graduation rates reflect a trend across the country, which anecdotal evidence suggests is partly due to efforts to keep students in school on the state and district level. But it is also difficult to measure the effect of external factors like the poor economy — which tends to keep students in school because they feel the pull of the job market less — and shifting state accountability requirements. The latest report released by the U.S. Department of Education marks the first time all states — except for three, which were granted deadline extensions — used the same definition to report graduation rates. In the next few months, researchers will be conducting analysis to determine what factors led to the success of some states over others, said Colleen Wilber, a spokeswoman for America’s Promise Alliance. But for now, Wilber said the current data stood as the best yet reflection of how states shake out in terms of their graduation rates. “It’s as close to apples-to-apples comparison as we’ve had,” she said.